On Tuesday, May 8, 2018, in our mutual hometown of Baltimore, I finally caught up with director Nick Kovacic, whose documentary Agave: The Spirit of a Nation I had watched (and reviewed) at SXSW 2018, two months earlier. 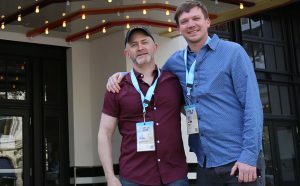 Kovacic – a founder, along with his Agave co-director Matt Riggieri – of the post-production house Digital Cave Media is no stranger to alcohol-themed films, having previously made both Brewmore Baltimore and Decanted. Here, he and Riggieri take us down to Mexico on a beautifully photographed journey through the meticulous artisanal process that is required to produce the best mezcal and tequila (both distilled from fermented agave). What follows is a condensed digest of our conversation, edited for length and clarity. Hammer to Nail: So, Nick, hello! What first drew you to the subject? Nick Kovacic: Well, it’s funny, because this is actually the third documentary that I’ve made about some type of alcohol – beer, wine – and this time, I was like, if I’m going to do one, I’m going to do it about the most interesting spirits that are created in the entire world, and that would be the agave spirits of Mexico. The plant has been used in the Mexican cultures for millennia, and so if there’s anything that really draws me into it, it’s just the connection to the culture, the people, the geographical area. Beyond the spirit, it’s the people and the story behind it that bring it home for me. HtN: So, could you describe this cycle of alcohol-related films? What were the first two? NK: My first film was called Brewmore Baltimore, and it’s a history of brewing beer in Baltimore. My second film is called Decanted, and it’s about Napa Valley winemaking. 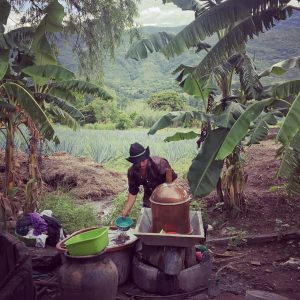 And now my third film, Agave: The Sprit of a Nation, and it’s about mezcal and tequila producers in Mexico. HtN: Now, your first two films – and correct me if I’m wrong – you directed alone, though you obviously have collaborators. This third film, you worked with someone directly, as co-director: Matt Riggieri. What is it like collaborating as a director after you’ve done a few by yourself? NK: Well, Matt and I started our company, Digital Cave, about 12 years ago, and we’d always worked hand-in-hand on all these different projects: he would help produce the films, I would direct them. So, I directed the first two, but with so much stuff going on, when we saw the opportunity to do this film, I was like, “Matt, I just need your help this time. I just don’t know if I can do it all by myself.” (laughs) Because it’s so much! Directing a film, you have all the weight on your shoulders. And the weight on your shoulders is there from pre-production to long after the film is being distributed, regardless of platform. This time around, I just didn’t know if I could do it. It was mainly a mental thing. But Matt and I had worked on all these films, together, and we had worked on all these different projects together, so it was really great, being able to collaborate on this film. I mean, he helped me so much on all the other films, it was kind of like we were both directing or producing, anyway. And this time, though I had edited the other two films myself, I had a fantastic editor: Clementina Mantellini. She’s from Venezuala, and lives in Guadalajara, and we did all the editing in Guadalajara, and she was really fantastic to work with. HtN: Did you have any other roles on the film? Did you shoot any of it? Who were your cinematographers? NK: Nate Pesce is a cinematographer, and he was the DP [Director of Photography] on Decanted, and along Mike O’Leary, shot a lot of Brewmore Baltimore. But I also brought on Ernesto Pardo. He’s from Uruguay and has been living in Mexico for 20 years now. And his eye for the detail and subtleness and different characters just really drew it out. We had a lot of conversations about how to go about it. We set ourselves rules that we worked within. That structure that we built for ourselves helped tell the story. HtN: Speaking of cinematography, the film is gorgeously shot, with amazingly beautifully landscapes. Obviously, technology is why it looks great, but I’m still curious to know what camera was used. NK: The film was shot on two cameras. There was an A and a B camera, and they were both RED Helium 8K cameras. The entire film is shot in 8K. And then there’s some drone footage that’s in there, that’s done with the latest Phantom, but the drone footage that we use is basically like a tripod in the sky. There’s barely any movement to it. HtN: Is that drone footage also 8K? Can the Phantom shoot in that resolution? HtN: So, I’m curious…when you’re shooting in 8K, and then you’re exporting in…what’s your DCP in, 2K? NK: 4K and 2K. It’s prepared to do HDR finishing, too. HtN: Wow. So, if you’re shooting in 8K, even if you’re preparing a 4K DCP, there’s a lot of room to reframe in post. When one shoots with that much resolution, I’m always curious how much reframing happens in post, or if you just keep it as is, and then prepare the lower-res export? We all know that David Fincher, for example, is the king of reframing in post. NK: We do a lot of post-production for other filmmakers, and every time, when you’re in the color-grading suite, and you’re at the very end, you’re tweaking frames, just to get re-sizes. Just do a little bump-in here and there, whatever. So, there’s always that aspect to it. HtN: But nothing major. Just the little bump in. HtN: I was just curious, because 8K is a lot of resolution. NK: Yeah, and with all that resolution comes all the data. It also requires a lot of hard drive space, both on the ground and transcoding-wise. Going into this film, because we had all this experience doing post-production on other films, we knew that we were going to need to have a really good post-production workflow to make this happen. I did the entire movie in 10 months. So, I needed to have something that was airtight, from Day 1 through 9 months later when we were done. We had come up with a crazy workflow to shoot … I’m, like, literally in the middle of nowhere, in Oaxaca, and I’m shooting 6 terabytes, every single day. So, I’ve got to get it out of the field, and I’ve got to get it transcoded to a manageable format for someone to edit. And we were editing just 2 weeks after we shot the first time, and we were editing and uploading dailies almost every day. HtN: Wow. So, we talked about structure a moment ago, and I’ve noticed a trend, which is not unique to your film, of late-arrival main titles. So, in other words, the film goes on for 15 minutes or so, and then the title comes up. Again, this is not unique to your film. Why do you think that is? We see quite a lot of story before we get the title. (laughs) This seems to be happening more and more. Were you thinking about that, or is that just what the structure dictated? NK: That’s a really interesting question, because the main title in the film doesn’t come until 11 minutes…I think it’s 11:22. HtN: It’s 11 minutes? OK.
NK: It’s funny, because we don’t have title cards, either, in the film, so basically the film just starts and there’s a statement, at the beginning of the film, and you just jump into it. I think the problem was that we finished the film in many versions. The version that’s on the screen is, I want to say, like version 14A. And all the way up until …version 12?…we always had it where the title card would come right at the beginning. There would be an intro, for like 2 minutes, and then there would be the title card. To me, the title card always means, definitively, “OK. That’s the start of the movie.” Right? (laughs) And so, to have it 11 minutes into the movie is weird, because we just watched set-up of all the characters, got through basically the first act, and then this is the beginning of the movie, starting at 11 minutes? I had the film structured differently, to begin with, where it took 20 minutes to introduce only 3 characters. But the goal with the current version was to do the intro, which is this night scene, and you don’t know what’s going on, and then we just shotgun through all the characters, and then once you get all of them done, bam, these are the people who embody “Agave: The Spirit of a Nation.” And I don’t even remember…I think we were watching a rough cut of it, whatever version, and I was like, “Let’s just put the title right here, at 11 minutes, after we introduce everybody.” Because in film, when you cut to black, or cut to a title, that’s like a clean slate to start something new. HtN: Again, there must be something in the air, because I’ve noticed this, and I watch a lot of movies. It’s not like it happens all the time, but perhaps it’s because people are more confident in throwing the title in that late. It works; there’s nothing wrong with what you’ve done. I was just curious. OK, I have just one more question. I really like your narrator, Damián Alcázar. Could you talk about your decision to have a narrator, and then how you got Damián Alcázar? NK: I never had a narrator before, in the other two films, and this being the third alcohol film – and I’m rolling my eyes, figuring I have to do something different next! – I thought that this time, it would be really important that the plant, itself, have its voice. It’s a voice of the people. And Damián is from Michoacán and he is, as they would say in Mexico, a campesino: he’s from the rural area and he grew up with nothing. He’s a champion of the people, and he is a man that is very politically and socially active. I didn’t know all of this. I saw him in a film out of Mexico, a couple of years ago, and just thought that the compassion that comes across, the empathy that he has for the other characters, was amazing. You could just tell: he’s a very genuine guy. And he also just had this absolutely amazing voice. So, when we were bouncing around doing the narration of this film – because we knew we wanted to do narration, early on – we knew that we wanted to have somebody who had that soul and heart. He isn’t easy for everyone to understand. English is not his first language. If you listen to the Spanish version of the narration, it’s different. HtN: I didn’t have any problem understanding him. NK: Some people have a really hard time. HtN: Well, then they’re just used to only hearing voices that sound just like them. It worked for me! Well, Nick, thank you so much. Congratulations on the film. It’s really beautiful. NK: Thank you for the interview, Chris! *In the interest of full disclosure, I reveal that Nick Kovacic is a graduate of the institution – Stevenson University – where I teach, though his graduation coincided with my arrival, so we never met until years later.